Mazda has been making some big moves lately and its new CX-9 is likely to be one of the biggest. The largest vehicle Mazda sells in the US is due for a complete overhaul and Mazda has provided Torque News readers a video sneak peek at what is to come. Read on for speculation, insight, myth, and whispered rumors. Mazda's 2013 CX-9 has continued the KODO design theme we first saw on the Takeri concept car that was actually the new Mazda 6 sedan hidden in plain sight. KODO must mean classy and understated in Japanese because that is the visual impression we get from these cars. Starting at the front, the lights of the new CX-9 are wonderful. No retina searing white dot displays like on the CX-9’s competition, the Audi Q7. Rather, we get a great daytime running light display and what seem to be HID headlamps. The strong, blunt nose we now find on the hit CX-5 works and it seems to suit this larger vehicle a little better. The low mounted fog lights work well in the design and the front end is not overly chromed. Kudos for that. It was starting to look like 1959 for a while there in recent vehicle designs. Moving back, the a pillars are steeply raked and cut directly to the hood without the glass guide line that interrupts such vehicles as Toyota’s Venza. In profile the alloy rims catch one’s attention and are well suited to the vehicle's sporty theme. In back the twice pipes look good and impart a tough look. Sadly, the rear wiper isn’t hidden. Since the Lexus RX showed the world that trick it is inexcusable not to get rid of that wiper. Inside the Mazda CX-9 the dash has the clean swept back layout many credit to the Volvo XC-60. It works and still looks fresh. The infotainment screen is lower than on many newer sport utes. This may make moving one’s eyes to see the screen more challenging, but it isn’t fair to judge until it has been tried. We can see that there are redundant buttons and switches. There are two rotary knobs to the sides of the control areas. Could one be a volume and on/off controller, and one a station selector knob? That would go very far in eliminating the many dings some manufacturers (such as Ford) are taking on quality surveys for crazy and difficult to use infotainment set-ups. Just behind the gear selector there is a covered area that likely hides the cup holders. Let’s hope so, because if it wont perfectly grab a venti size Starbucks cup this vehicle is going nowhere. Kidding aside, the interior is sporty, but classy. That look and feel used to belong to makes like BMW and Audi, but now it is available in most Asian makes. 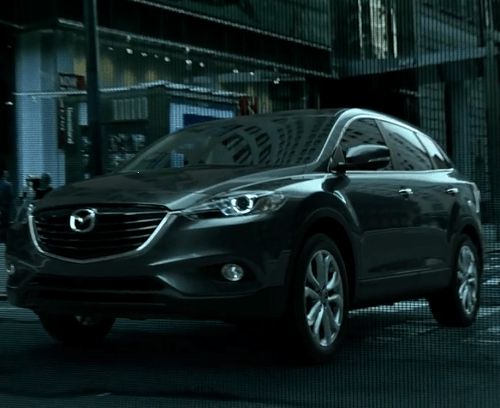 Mazda will surely run this 2013 CX-9 past the Skyactiv engineering department to add in lightness and to boost fuel efficiency. We can only hope it does not work as well as it did on the CX-5 because that vehicle is slooow. If Mazda had the bravery not to increase the size of this vehicle to accommodate a 250 pound, 6 foot three automotive critic sitting in the third row it will do better with customers than the reviews would lead one to believe. Mazda has teased us with this short film. The 2013 CX-9 is making the auto show circuit now, so expect a release early winter.